I've been following the Apple Tablet, "iSlate", and the now official iPad rumors for a long time, so I was glad to finally see the most anticipated piece of hardware since the iPhone finally came to fruition. I was a bit disappointed, but this was due to the intense rumors surrounding this device. No OLED, no 3D interface, not even a camera? From what I saw in the keynote, there was no groundbreaking innovation or new technology that would change the world. However, after viewing the product video, I became more excited about the interface, and I believe that there will be small hidden gems in the OS that will only show up when we get our hands on the device (in 60 days). I will hand it to Apple that this was a shrewd and timely business move. The company had to get in now to compete with the Kindle and the Nook, and make no mistake that the iPad is going to square off firmly against these two devices. My guess is that Apple wanted to make a more innovative device, but time dictated the need to get something out there this year, and Mr. Jobs realized that going the easier route of enlarging the iPod was a safe enough bet to drum up solid business and begin Apple's reign on e-readers. We use Tablet PC's at ETHS. I've been impressed with the functionality of our Lenovo x61's and how they've allowed our teachers to show handwritten notes electronically, annotate text on screen, and open doors to interacting with their students in new and exciting ways. However, unless we went 1:1 with Tablets, the devices contribute to perpetuating a teacher centered classroom. The movement to 1:1 with netbooks has been gaining momentum steadily. I have been intrigued by the possibility of offering all students access to computers in the classroom with game changing features such as online textbooks, collaboration tools (such as Google Apps), and Internet curriculum materials becoming more readily available and richer in content. The question sure to be asked is whether the iPad is indeed a "netbook killer"? I would argue that it will be in education. The ability to access electronic textbooks, hyperlinked content (assuming we get wireless access at ETHS), and collaborating with other students in the classroom is the key for this technology to establish a firm footing in the classroom. The reason why the iPad can succeed where netbooks can't or won't will lie with its unique and user friendly interface. 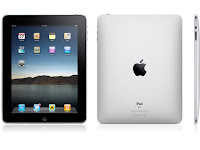 Ask any student what they would prefer: a netbook or an iPad, and I would bet that nearly everyone would say an iPad. Why? Simply because Apple excels in design, interface, and form. And at $499 (will there be an education discount? ), I think that the iPad may cause those moving towards 1:1 to possibly reconsider their invoice for Dells, Acers, or Lenovo's in favor of the company from Cupertino.